The F7000 is the most popular selling Teeter inversion table. If you are considering the F5000 you may want to take a look at the F7000. includes the 88 page "Better Back Better Body" book, the Corner Feet and EZ Angle Tether Strap. a reason to consider purchasing the F7000 instead of the F5000 please click here. 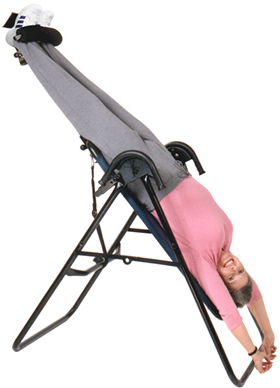 Teeter Hang Ups inversion tables are the best selling inversion tables in the world. They are the best quality, easiest to assemble and have the best warranty. The F5000 is the basic model. All Teeter Hang Ups inversion tables allow you a full range of motion and to hang at all angles of incline including total inversion locking for inverted exercises - sit-ups, inverted crunches, inverted squats and other inverted exercises. The F5000 and the F7000 can be modified with the Adapter Kit to us Gravity Boots - please see below. The F7000 is a more deluxe model. It is the basic table with three additional features and it also includes the the 88 page 'Better Back, Better Body' book. The highlight of the F7000 is the EZ-Stretch Traction Handles, which provide added benefit to inverted stretching and decompression. The handles make it possible to achieve the equivalent of a fully inverted stretch even while at lesser angles. In addition, they can be used as a tool for rhytmic intermittent traction and oscillation - The Rocking Motion. If you have a difficult time reaching down to ankle level you may want the F9000. The Easy-Reach-Handle allows you to lock yourself in and unlock by only reaching down to knee level. If you are interested in the best, easiest to use and most elegant inversion tables, please see the Power II and Power VI inversion tables. If you have a question about a table you do not see on our site please contact us. Exceeds the 400% safety factor for the 300 pound weight capacity. Withstood 1440 static load test. Reduces shaft movement to allow for quiet, shift-free rotation - the only design on the marktet to structurally engage the main shaft. Washable mat with triple-stitched seams removes easily for cleaning. Can be converted to use with Teeter Hang Ups Gravity Boots. Instructional DVD and Laminated Owners Manual. The F7000, F9000 and Power II include the 88 page 'Better Back, Better Body' book. Covers all components. The best warranty in the inversion industry. Package - 50" x 30" x 6"
Regular price for the F5000 is $359.95 plus shipping and handling. Our price is $299.00 - total price to your door. No hidden costs. We advertise and sell Teeter Hang Ups Inversion Tables at the lowest allowable prices. F7000 are a reason to consider purchasing the F7000 instead of the F5000 please click here. One of the great values of the Teeter inversion tables is that they can be modified to be use with gravity boots. The F5000 and F7000 Inversion Tables can be modified with the Adapter Kit. The Adapter Kit includes Gravity Boots and a CV Bar (conversion bar) to convert the standard ankle clamp assembly for use with the Gravity Boots. The Boots wrap just around the ankles and provide them with extra support and comfort; the Gravity Boots can also be taken with you on the road. With the Gravity Boots you can invert on any bar that meets the security requirements. Most people do not need gravity boots to get the full use of their inversion table. If you order the Teeter Hangups F5000 with the Adapter Kit you will pay $399.00. If you order the Adapter Kit separately at a later date you will pay $114.50. If you do order the boots and conversion bar at a later date your cost is only $14.50 more than if you purchase at the same time as your table. All sales tax will be paid by our company. Most people do not need gravity boots to get the full use of their inversion table. If you choose to order the boots and conversion bar at a later date your cost is only $14.50 more than if you purchase at the same time as your table. All of the Teeter Hang Ups inversion tables we sell are new and factory direct. We do not sell used inversion tables or refurbished inversion tables or damaged inversion tables or cosmetic defect inversion tables. Most items are shipped UPS ground and if we have your e-mail address we will send tracking information and estimated date of arrival if available. We offer an Unconditional 30 Day Money Back Guarantee starting from date you receive your item. Unless otherwise indicated the term table will refer to F5000 and F7000 tables. Use your table for a full 30 days from the date you receive your table to be sure it works for you. If a table is returned there is an $30.00 service/restocking charge. If returned buyer is responsible for shipping costs both directions. Table shipping and handling are assumed to be $50.00. F9000 table shipping and handling are assumed to be $75.00. handling are assumed to be $18.00 plus an $10.00 service/restocking fee. If Table, Gravity Boot and CV Bar combination are returned shipping is assumed to be $68.00. Service/restocking charge is $30.00. before shipped there is a 6% charge incurred. If item is canceled after being paid & shipped and item is not accepted there is a shipping charge and $30.00 service/restocking fee for tables and $10.00 for boots 10% for other items. Shipping weight of table 70 lbs. The Teeter Hang Ups F5000/7000/9000 Inversion Tables and Gravity Boots come with a 5 year limited warranty.